Yoshidabashi Bridge in Yokohama, Kanagawa Prefecture. 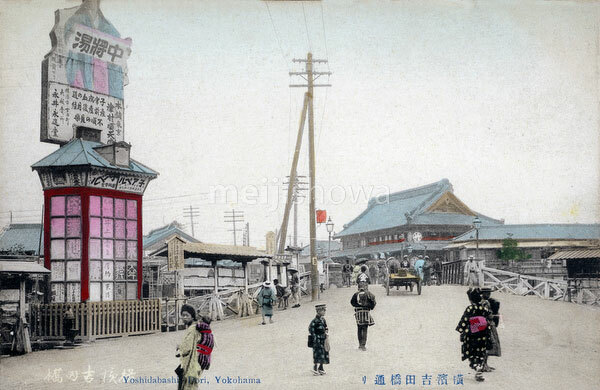 On this postcard Yoshidabashi is still a steel bridge. Completed in 1869 (Meiji 2), it was Yokohama’s first steel bridge. It was designed by British engineer Richard Henry Brunton (1841-1901), who was hired by the Japanese government to build lighthouses and the first telegraph line in East Asia. In 1911 (Meiji 44), Brunton’s steel bridge was replaced with a concrete bridge. Also see 70206-0005 – Yoshidabashi.